[Updated with video] There can be no more business as usual in Bermuda — and both the public and private sectors need to reassess and retool the traditional ways they operate if the island is to enjoy renewed economic growth, Premier Cox said this afternoon [Feb.3]. 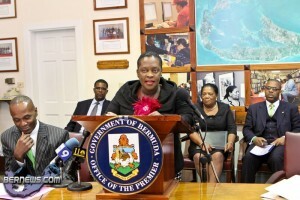 Speaking at a press conference to discuss the achievements of her first hundred days in office, the Premier — flanked by Cabinet Ministers — said she had made it her overriding priority to restructure Government operations because the old infrastucture was not suitably geared to the new conditions Bermuda is operating in. 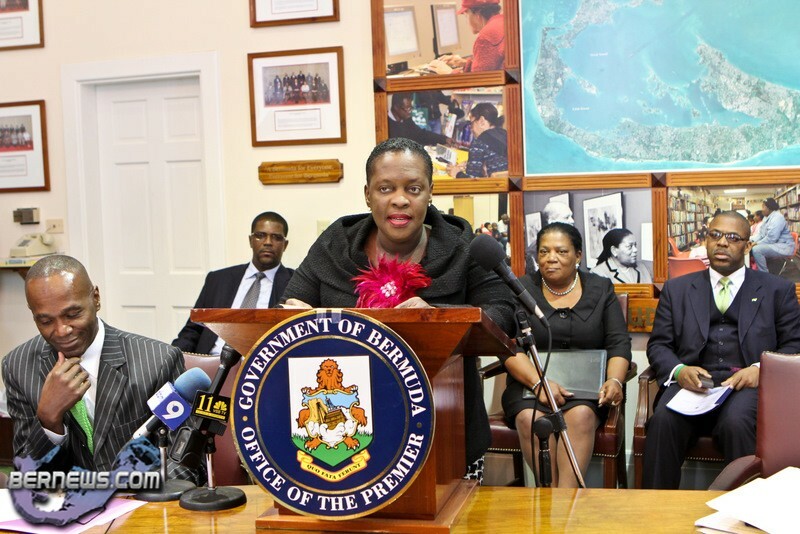 She said she has met with stakeholders in the local economy in recent months including the island’s banks, hotels, off-shore financial services companies and unions. The Premier said there was a basis for mutual understanding and joint action among all of the key players when it comes to repositioning Bermuda to meet the challenges of the 21st century global economy. “What is notable about these meetings is the degree of common ground, and the degree of willingness to work collaboratively and cooperatively with the Government,” she said. “Our differences are dwarfed by our common purpose. She said the aftershocks of the 2008 global recession were still being felt in Bermuda and the way out of these “tough times” would not always be easy, involving sacrifice on the parts of Government, employers and employees. “All of us will feel some measure of pain,” she said. Hard times bring out the best in us. Given the challenges that face us, your Government has to be working at optimal efficiency. Our new administration has had to hit the ground running. I have been proud of the way Ministers have demonstrated commitment, conviction and courage. Delivering services and programmes to the people we represent is key for any Government. This is even more critical when our people are being challenged daily. Since assuming office, I have listened, met and dialogued with many. There is a tremendous reservoir of talent and goodwill in the community. Many have offered to help, whether young or more experienced people, both Bermudians and non Bermudians. These exchanges benefit Bermuda and add to the Government’s bank of ideas and our strategies. I have met with representatives from financial institutions, our hotel owners, the Bermuda Hotel Association, the Association of Bermuda Insurers and Reinsurers (‘ABIR’) and Bermuda First. I met with the Bermuda Industrial Union (BIU) President and his Executive Council. I salute the BIU President for his game-changing approach to how the unions, the public sector and the private sector need to interact when our country is going through tough times. All of us will feel some measure of pain. It is not easy, but it is necessary. I met with the current Bermuda Public Services Union (BPSU) leadership and the President-elect. We had a frank and productive dialogue. I also met with the representatives of the Trade Union Congress and numerous other groups and listened to their issues and challenges. What is notable about these meetings is the degree of common ground, and the degree of willingness to work collaboratively and cooperatively with the Government. Our differences are dwarfed by our common purpose. All of us have a role to play and the Government will work tirelessly with all who have the best interests of Bermuda and her people at heart. The country’s long-term prosperity requires the participation of all in the economy. The necessary reform of Government is also pivotal. During this first 100 days, Ministries have been re-calibrated so that we can raise the bar and deliver with a new integrated approach to the delivery of services. There have been teething pains, but it is necessary that your Government change the way it does business. It cannot be business as usual. The reform of Government will not end with the re-alignment of Ministries. We must deliver more with less. We must become more efficient, more service oriented and more responsive to the needs of the people and business. Given this need, I invited representatives from the National School of Government to conduct a review of the Civil Service. They came prior to Christmas and have returned to conduct a more thorough review and make recommendations for change. The review will spur us to be even more responsive to the needs of the people. While the Government embarks on its reform there are some changes occurring in the private sector. Operating models have to change. As a country we will have to shift and to have a radical rethink as to how we do business. Your Government is committed to providing employment for our people and setting the table for renewed economic growth that creates new jobs. Your Government will continue to protect Bermudians in the workforce, and will remain vigilant in defending the employment rights of Bermudians. Your Government recognises the need for our polices and programmes to reflect an emphasis on social justice and equity. This covers the waterfront. It includes our education system, our criminal justice system, our system of healthcare, our tourism product, our border controls, our public infrastructure, our transport and housing policies, our social services network, our environmental policies and our economic policies. Your Government recognises that any strategy to reduce crime has at its core, the duty of the Government to protect its citizens and to act against those who break the law. A zero tolerance approach to lawlessness is important. Our enforcement and our sentences must be robust enough to deter would-be criminals. However, punishment on its own is not enough. As the Government we also have a responsibility to address problems that can lead people into crime. In addition to substance abuse, poor housing, lack of skills and lack of employment can be major obstacles to preventing repeat offending. Our substantive effort at raising skills and opening opportunities to get more offenders into jobs will go a long way to tackling the cycle of repeat offending. Strategic linkages across Ministries contribute to this. We must also address the underlying causes of crime and this includes helping offenders become more productive. There are substantial reforms that are already delivering results. However it does not stop there. Ministers are busy. Consistent with this, we have been hard at work over the preceding months to realise this goal. For example, we have been laying the groundwork to proceed with the full implementation of recommendations found in Professor Ronald Mincy’s Study, on ‘Young Black Males’. We aim to facilitate the type of workforce development needed to better serve our most precious resource, our young people. While much is still to be accomplished, now is not the time to shrink from our challenges and our responsibilities, but rather, to redouble our efforts to invest in the hard working families throughout Bermuda and in our country’s infrastructure. Now is the time to make ourselves more innovative, more competitive and ready for the challenges of this 21st century global environment. The Government cannot do it alone. This must be a team effort at every level of our society. Some may advocate that present circumstances are too great and too daunting. We do not subscribe to that view, and remain optimistic that the resilience found in Bermuda’s people represents our greatest and most valuable asset. Although difficult choices will be necessary, the task and direction are clear. Challenges throughout the global environment require a new paradigm for local empowerment that will enable us to secure our people’s future. Our vision for Bermuda is a vibrant and innovative economy that draws on the Bermudian traits of ingenuity, entrepreneurship, intellectual attainment and hard work. Together, we shall draw on these traits to ensure our shared vision becomes a reality. The work continues. We remain optimistic about our country’s future. Whats with all this PLP stuff Bernews. Why are they talking all of a sudden. Yeah…I know.. it the ….fault. The Premier said on the evening news she could balance the Budget tomorrow if she wanted. As she laughed she said, all I have to do is cut the civil sevice down. Quite cynical really since Businesses are laying off staff and closing down. Maybe the PLP needs to replace her Portfolio with someone with a bit more compassion, not to mention Vision. Optimistic? ” I could fire the civil service” unquote. Cynical, especially when good Bermudians are loosing their jobs every day. Why is Paula Cox acting as though she is part of a new administration?? I guess it is a new administration, but what would you do if you were in her shoes. do we really know Paula Cox? what if she is still a cog. good talkers are not necessarily good leaders. she had ample time as Finance Minister to control Bermudas finances, where do we draw the line. when will we truly be convinced that this individual has true leadership. how far should we fall? when do we say ENOUGH. you can change the individual and keep the party! And the former Premier said…..”This is the Platinum period”. I think that quote was meant to be cynical. Platinum my azz. Anybody wanna buy a condo? I truly wish you the best of luck selling your condo. It must be difficult with all the excess housing and more still being built. It is basically a load of mumbo jumbo. In the US & Canada towns had to drastically cut their budgets, lay off staff, get more work out of those left, & still deliver services. Bermuda needs to do the same with the civil service. Of course that is not going to happen in Bermuda. The PLP would lose too many votes from the civil service & everyone knows that the good of the PLP party trumps the good of Bermuda every time. We have basically the Cabinet as during the Brown regime. The same people in the same Ministrys. How can any change be expected especially when we have the SAME Finance Minister who has now been elevated to Premier as well? Isn’t saying “no more business as usual” basically admitting you “messed it up” previously? She is utterly useless. Receptionist that do not answer phones. When they do, many are incompetent. Government website that is so disorganised and bulky, with many of the links not even working. Far from adequate contact information on-line suitable for a 21st century globalised economy and society (i.e. emails links). Civil servants that do not reply to your emails and when you call to find out why, they are not available. And although the same people stay in these jobs for years and years, their administration, people management and job effectiveness doesn’t get better. Of course there are exceptions but its not so much the systems that need to change but the mentality of the people doing the jobs. The HR/Training Dept. is fighting a loosing battle. When you have ‘life tenure’ from the day you walk in the door, why even try to be a good employee? Attitude of entitlement on all levels. Clean the Stables of the OLD GUARD and start afresh. he’s not worth it. Is this the US, Canada or England you are referring to? The civil service worldwide has it’s problems!